The exhibition “On the Contemporary”, as its title suggests, proposes that contemporary art is a defined period of art history driven by the expansion and eventual contraction of the art market from 2000 – 2025. 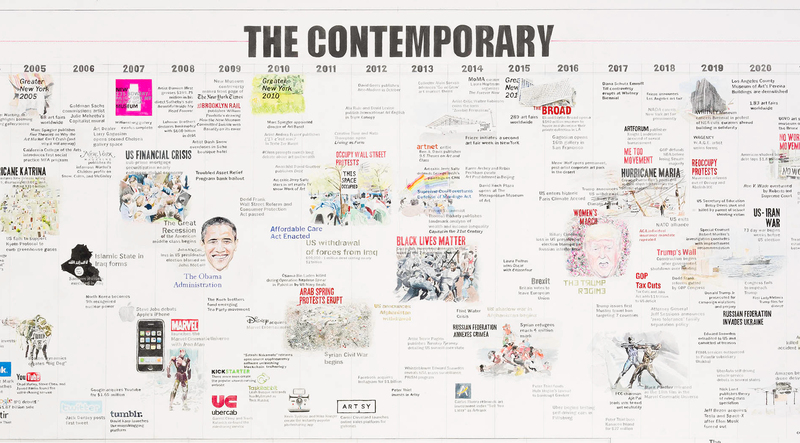 In the wake of the United States mid-term election on November 6th, the centerpieces of the exhibition outline the relationship between contemporary art and the political and socioeconomic contexts of the period through two large scale visual timelines, one composed of over a 100 Artforum advertisements rendered in watercolor and acrylic. Together, along with several other historical and speculative works, the artist challenges the idea that neoliberal, free market capitalism is the best system to support democratic societies and cultural production in a time — as the urgency of the US mid-term elections demonstrate — when these systems are in crisis around the world. “On the Contemporary” is a continuation of Powhida’s exhibition “After the Contemporary”, the artist’s first museum solo exhibition at The Aldrich Contemporary Art Museum in March-September 2017. Here, Powhida’s new paintings and drawings continue to ask what do the changes in contemporary art predict about the future of society? Powhida’s research-based analysis and speculative future outcomes trace a course of greater inequality that serves as a troubling warning if current trends continue.